Preheat gas grill for medium-high heat. Whisk together whiskey, ginger, agave, soy sauce, chili sauce, garlic and cornstarch in small bowl; set aside. Place four 18x12-inch pieces of heavy aluminum foil on counter. Spray each with cooking spray. 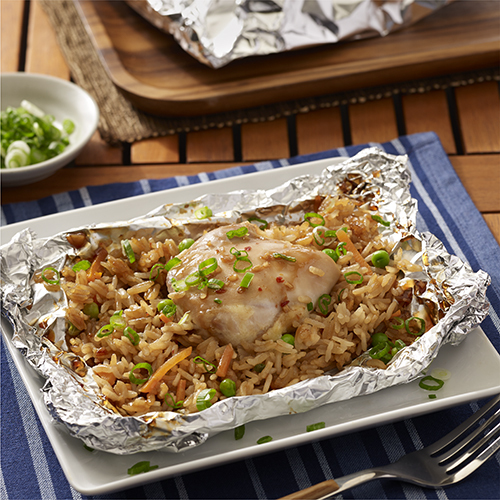 Divide rice evenly and place on each piece of foil. Top each with chicken thigh and sprinkle with salt. Carefully fold edges of foil upward; pour about 1/3 cup sauce mixture into each packet over chicken. Double fold top and ends of each piece of foil, leaving space for steam to gather. Place packets on grate; cover grill. Grill 15 to 20 minutes or until chicken is no longer pink (180°F) and rice is tender. Carefully open packets; sprinkle with green onion, if desired. Packets may be baked on shallow pan in 425°F oven 25 to 30 minutes or until chicken is cooked through (180°F) and rice is tender.